Situated near Park Mall shopping centre, this business centre provides serviced office space that is well-connected to the whole of the south east and surrounded by five train stations. This recently renovated centre has office space available with full cabling, heating, kitchen areas, storage, parking and security services. The centre is close to many local amenities such as shops, restaurants and cafes, and other established businesses are close by. It is located close to the M25 (Junction 13) and Ashford Train Station, with direct links to London Waterloo. 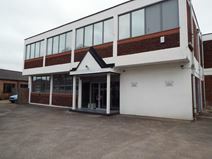 Available on a five year full repairing lease, this two-storey building has been transformed to create a pleasant working environment that is just a short walk from Ashford train station and just a couple of miles from London Heathrow Airport for quick access to domestic and international travel. Tenants have access to the space 24-hours a day and there is also round-the-clock security, for peace of mind. Ideal for businesses looking for space in the thriving town of Ashford, this modern, secure and professional business centre allows you to increase or decrease the amount of office space as required as well as providing you with access to meeting rooms. Very near to the town centre, where there are a range of attractions at your disposal, including restaurants, bars, shops and various places to stay.